My March Box from Knoshy has arrived! The box actually arrived a few days ago … but I’m behind as usual! My box from Knoshy is always a box that I’m eager to receive. It is a very carefully curated box and I usually love the product choices, and I also appreciate the opportunity to try something that maybe I wouldn’t have tried without this box bringing it to my door. 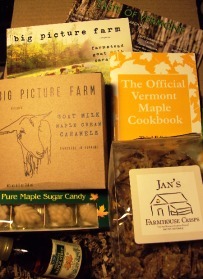 I love maple, so I was quite pleased with the selections of this month’s box. I’ll let you know what I think of each product as I try them out! My March Box from Graze is Here! The day that my Graze box arrives in my mailbox is a happy mail day, indeed! And this month is the first month where I am seeing the “power” of choice with Graze. I received two products that I previously liked/loved. Yay! 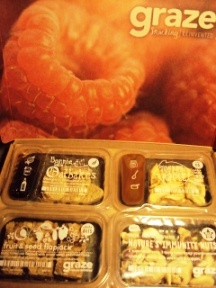 Both of the revisited products are from my very first box from Graze. The first snack is the Fruit & Seed Flapjack snack – I had marked this one as a “like” and the second snack is the Toffee Apple snack, and it’s a snack tray that I LOVED. I’m especially happy to have this snack again … and I’m eager to find out if I enjoy it as much now as I did then. As I write this, I’m snacking on the Fruit & Seed Flapjacks and they’re so yummy! I’d take a tray of flapjacks to a granola or energy bar any day. Also in this month’s box are two new-to-me snacks: Bonnie Wee Oatbakes and Nature’s Immunity Nuts. I’ll be writing reviews on these two snacks later (after I’ve had a chance to enjoy them), but I won’t be writing another review on the previously reviewed two snacks. Interested in getting your own Graze box? I can give you a “friend code” that will allow you to join Graze! Just comment on this post with your email and I’ll respond to your email with the code. It’s a great price: just $6 per box! It’s a great way to get yummy fun in the mail. When I eat pie, I like to sip on hot black tea. And even though this is a snack mix and not technically “pie” – I decided to brew myself a cup of Malty Assam Tea from Tea People. A really lovely pairing! YUM! This might just be my favorite snack that I’ve gotten from Graze yet! 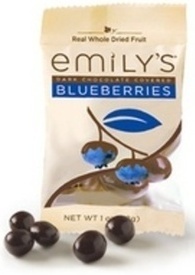 There are two different kinds of raisins: dark raisins that have been infused with lime, and green raisins. I don’t think I’ve ever seen “green raisins” before. They look like gold raisins to me, and taste like them. Sweet and plump. The lime infused raisins are my favorite of the two raisins though, I love the bright, citrus-y note they add to this snack mix. The sponge … isn’t as sponge-y as I recall other ‘sponge’ from graze to be. These are actually crunchy … like a Nilla wafer. Tasty and they add a pie crust flavor to the mix. I love the meringue! Crisp and light and airy! This snack is fun to eat when I put one of each element into my hand and eat it all at once … it is very “key lime pie” ish! But I also enjoy popping each item into my mouth individually and exploring the flavors. If I were to change anything about this particular snack, it would be to have more lime flavor to it. Maybe there could be some lime in the meringue bits or the cookie bits. I “loved” this snack on my Graze account. I hope they send it to me again soon. I’d be happy to have it in every box. Ingredients: brown rice syrup, strawberries (strawberries, sugar, rice flour, sunflower oil citric acid), oats, cashews, figs (dried figs, rice flour), crisp rice (rice flour, sugar, malt extract, salt, mixed tocopherols), apples, coconut, chia seeds, sesame seeds, tapioca syrup, natural flavors, sunflower oil, sea salt, citric acid. I received this energy bar in my January box from Knoshy. I decided to go with a bowl of Matcha to sip with this energy bar to get the most out of the energy aspect of the bar, since Matcha is one of the most energizing teas I know of! I had this Lucuma flavored Matcha from Red Leaf Tea. Lucuma is a fruit, but it’s a very subtle tasting fruit in this Matcha, tasting a bit like maple. Although this particular energy bar was not my favorite from Off The Farm, these two things together: Matcha and energy bar … had an energizing effect! Off The Farm has three different varieties of their energy bar, and with this one, I’ve tried all three! And of the three … this one is my least favorite, and it surprises me to say that, because I love strawberries and coconut. I thought for sure this would be my favorite, but I have to say that if this had been the first bar that I had tried from this company rather than the last, I would not have been as excited to try the other two flavors. Don’t get me wrong … this is alright. But … it isn’t as delicious as the other two. It … needs something. The bar itself is tasty, it’s chewy and has a lot of nuts and seeds in it to keep it crunchy. The strawberries are flavorful and the coconut adds some nice texture and flavor to the bar. But … something … is lacking in the flavor combination and I am not sure exactly what it is. After reading the ingredient list, I see that the nut here is cashews, and maybe that’s the issue. Hey, I love cashews … but they are kind of a … mellow tasting nut. Maybe something with a little more pizzazz. Walnuts, perhaps? Pecans? Almonds? Macadamia nuts might be a really cool addition to these and would elevate the flavor of the coconut in an interesting way. It’s a tasty bar … but, it lacks the interest and excitement of the other two bars. It just needs something, because it’s kind of boring.